Do you have an idea of what you are looking for? Try our CarFinder and we will begin the search! In addition to our 100+ vehicles in inventory, we have access to over 50,000 vehicles through our exclusive dealer network. We also have access to several auctions in which the public does not have access to. We will send you photos and details of the vehicle(s) that interest you most, automatically … no hassles, no obligation and your request is confidential. 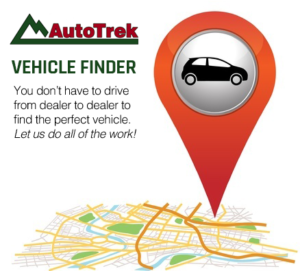 With AutoTrek, you tell us what you want, we find it, we negotiate a great price, you drive it home. It’s just that easy!